Can you believe it's been nine whole years of BFTB? More importantly, can you believe the momentum is still growing? This is the craziest time to be an Action Force fan in decades! In two very short weeks we have the incredible Roll Out Roll Call 3 convention! 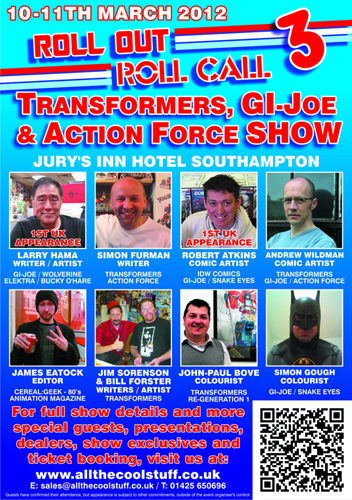 Special guests include none other then GI Joe comics guru Larry Hama in his first UK public appearance! The same goes for Robert Atkins, fresh from the GI Joe Snake Eyes comic for IDW! Balanced neatly by the legendary Simon Furman and Andrew Wildman of Marvel UK's Action Force and Transformers comics fame. 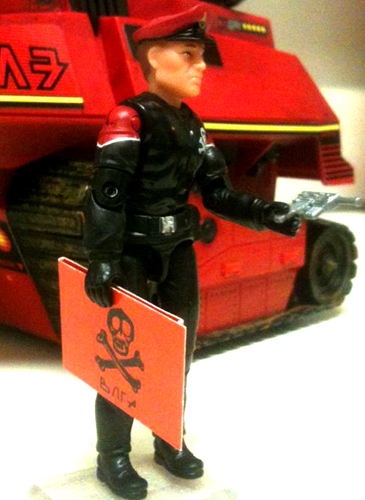 Also, don't be surprised if you run into the guys from the GI Joe RAHC Guide and What's on Joe Mind podcasts! Book your tickets now! This spectacular two-day event will feature special guests, presentations, dealers and of course convention exclusives! I am extremely proud to announce my contribution to the event, Baron Ironblood 2012. A tribute to the original Action Force Baron Ironblood figure. Supplied with a double-sided map, MP7 with three removable accessories, figure stand, resealable clamshell and reversible filecard. There are only 100 being made so don't miss out! 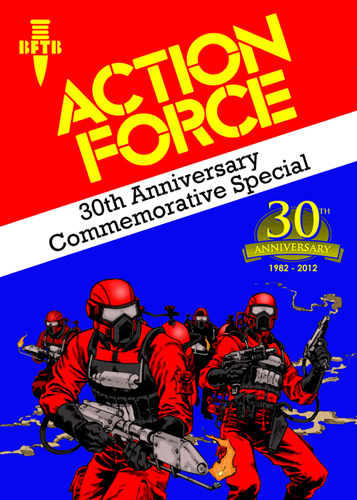 Also available will be the fantastic Action Force - 30th Anniversary Commemorative Special. This A4, 100-page retrospective contains the entire Action Force story from the very beginning to the present day. A must-have for any serious Action Force collector! There are only 100 copies being printed! And let's not forget the repro Black Major codebooks! Essential for anyone who owns the Vacation in the Shadows boxset or as a replacement for the original Black Major! 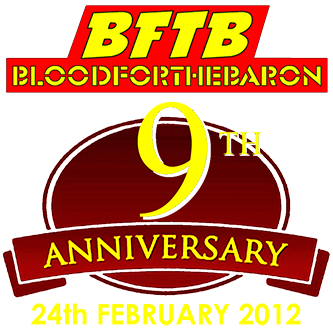 Created for BFTB by The War Department, 10% of all sales are very kindly being donated towards the site upkeep. By sheer coincidence, today I received this fantastic Red Shadows font from a forum member! Now we can all send messages in code! Best birthday present ever!! Thank you, Chad! Action Man finally comes home to BFTB with his very own set of archives! We still need lots more scans and info to complete the comic collection but for now, there are loads of new comics for you to enjoy! The entire BFTB archive format has been rewritten and navigation is now even easier. The Toys, Comics, Customs, Dioramas, Fanfic and Muton World Tour archives have all expanded. The Toys archive now boasts alphabetical and chronological indexes while the Comics archives are now fully downloadable in PDF format, not to mention a new showcase gallery for the exclusive BFTB Action Force comics printed by Rising Sun! I also thought it was high time that the monthly winners of our Custom Competition had their own showcase gallery too. Check them out! There's more. To celebrate this auspicious occasion, the ever-generous Rene Andersen of http://www.action-force.dk very kindly helped me to create a diorama. His amazing photographs can be seen in the BFTB adventure Operation: Red Tide! 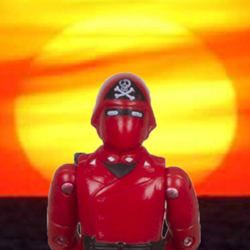 See what happens when the Red Shadows fall upon the most powerful warship in the known world in the midst of a pitched battle between Action Force and Cobra! Also up for your enjoyment is the fanfic Codename: Bombardier. Featuring knockout art by John O' Hagan, this dark tale features the very first mission for the Black Major! Find out not only what happened to the original Action Force but how and where Baron Ironblood gained his fearsome technology. 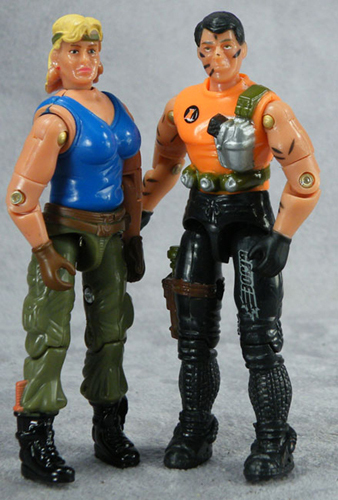 Starring the members of the lost Action Force team, Special Weapons Force! And if by any chance you're still not satisfied, may I heartily recommend the Action Farce lunacy from Alan Schell? It's an absolute gem, chock full of mayhem, mania and Mutons! Images courtesy of The Internet Comics. 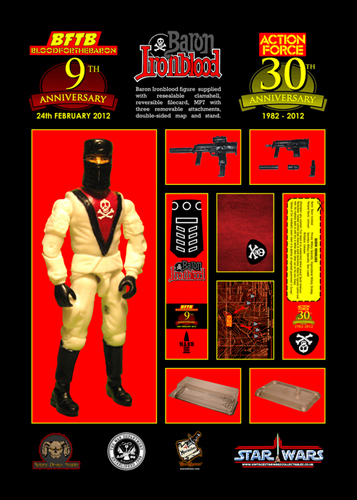 Operation: Red Tide, Codename:Bombardier and Action Farce are all included in the Action Force - 30th Anniversary Commemorative Special. 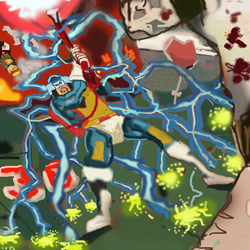 And just to set things off nicely, there is an incredible new piece of artwork gracing the homepage. 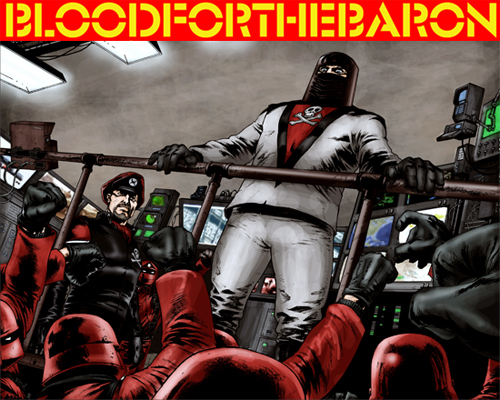 Hats off to Flavio Silvestri for truly capturing the essence of Blood For The Baron!! Why are you still here? Come and join the party! Remember, Roll Out Roll Call 3 is only two weeks away and you do not want to miss this event! Thank you for nine truly amazing years, the best is yet to come.